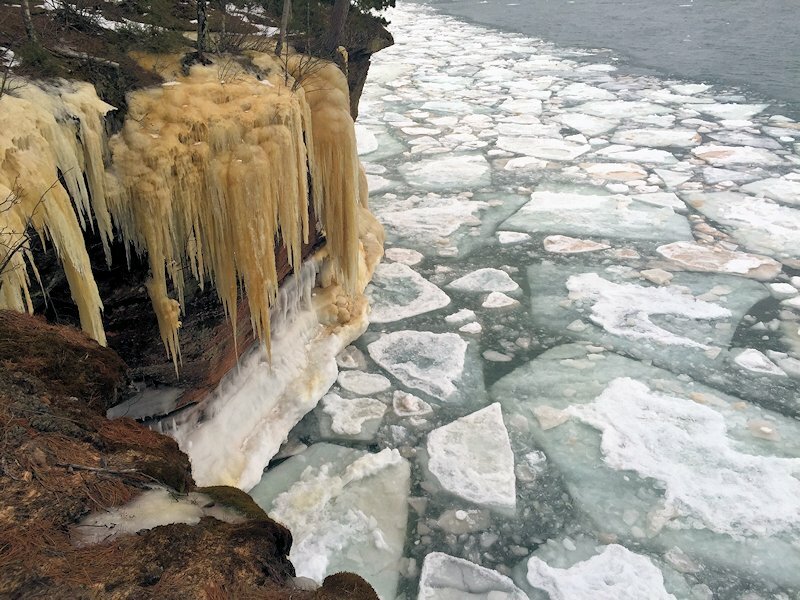 At the extreme western end of the mainland portion of the Apostle Islands National Lakeshore, about 5 miles east of Cornucopia, Wisconsin, is Meyers Beach Recreation Area. 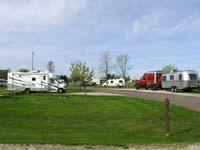 The Park Service has recently paved the road into the beach and created an ample paved parking area. 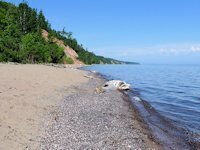 While the beach itself is quite attractive and offers a nice spot for swimming, a picnic, or beachcombing, its popularity is mainly due to something about 2 miles away: the Sea Caves of the Bayfield Peninsula. 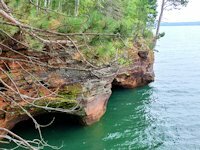 The Apostle Islands Park Bayfield Sea Caves make Meyers Beach a popular departure point for Kayakers wishing to explore the caves. 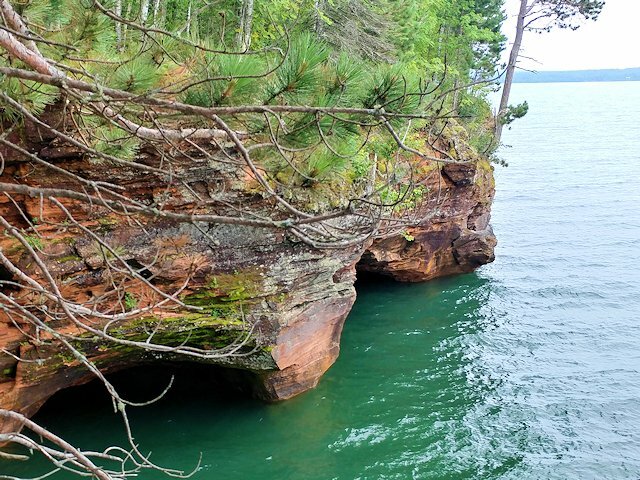 The caves can also be seen by taking a 1.8 mile hike up the Lakeshore Trail. 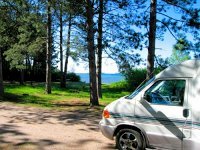 (Note for backcountry campers: there is a camping area 2 miles down the Lakeshore trail near Sand Point.) Having no kayak, Jo and I chose the land route to see the caves. 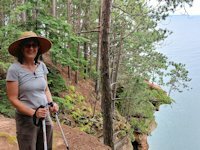 Although called The Lakeshore Hiking Trail, views of the lake were rare until we got near the caves. 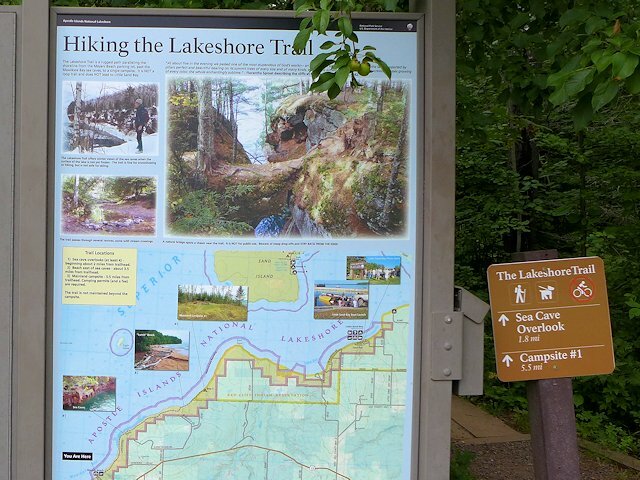 The hiking trail runs near the lakeshore, but the woods were too thick to see the lake clearly. 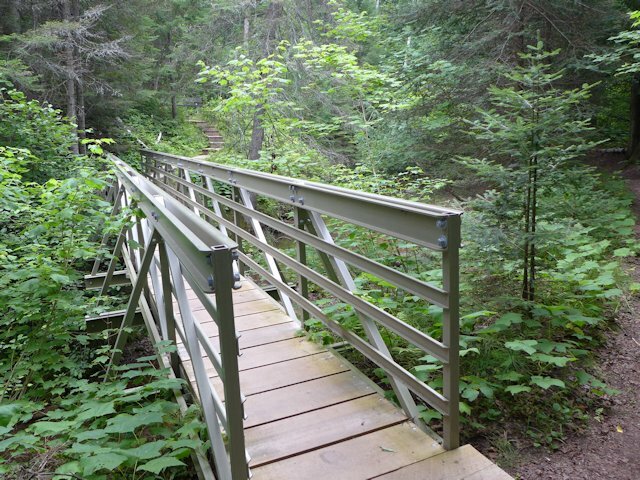 These woods with its variety of tree species would be especially attractive during the fall color season. 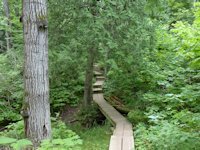 The trail was rated moderately difficult because of the frequent up and down undulations; however, we found it well maintained with stair steps wherever the trail got steep. The trail crossed a number of creeks but all but one were dry due to the drought like conditions at the time. But even if the trail had been a drudge of a hike, the reward at the end, the Sea Caves, were worth it. < < < After hiking for about an hour through woods too thick to see the lake clearly, we get a scenic lake view. < < < Looking down into one of the caves. < < < We walked further east on the trail and the Sea Caves continued along the shoreline, but the views of them weren't as good from above. 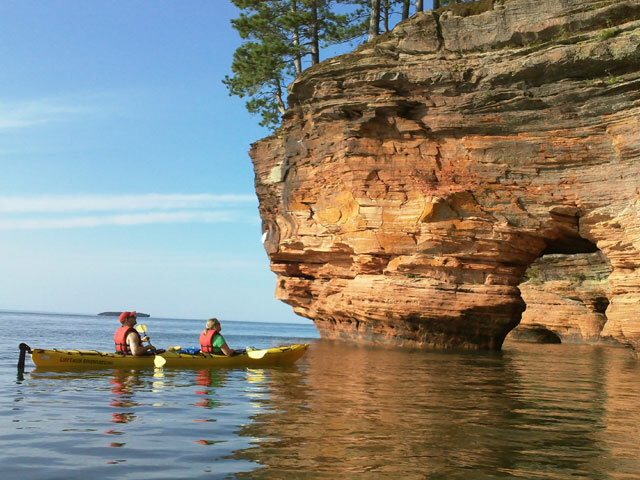 Here they can be best seen from the water, by Kayak or an Apostle Islands Boat Cruise. The island in the distance in the photo is "Eagle Island." On the return hike, we found a sand road that led to the waterfront so walked the beach back to the parking lot. So we were able to see some different scenery than the hike into the caves. 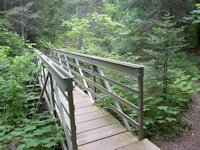 Since our hike, pictured above, several years ago, the Lakeshore Hiking Trail to the Sea Caves has been substantially improved, with bridges and board walks over rougher and wet terrain. 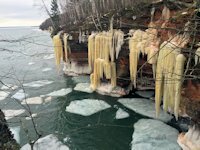 Here's a few pix from a 2017 hike our friends Scott Savage and Lynne Herrli took out to the sea caves. See more pictures of the Mainland Sea Caves from the water. 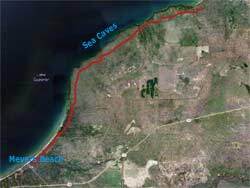 Here's an aerial view from Google Maps of the Meyers Beach Apostle Islands Recreation Area and the Sea Caves hiking trail. Some winters Lake Superior doesn't freeze over enough to safely walk on the "water" to see the Caves covered in ice sculptures. 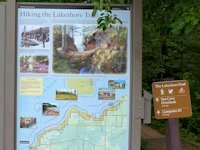 But you can still see Mother Nature's works by snowshoeing or hiking the Lakeshore Hiking Trail in the winter. 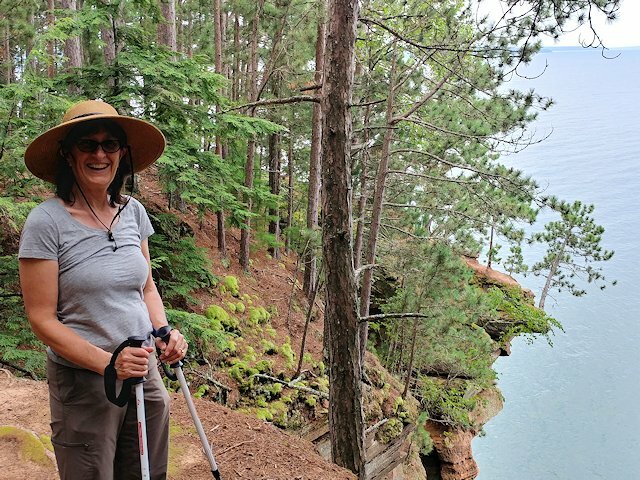 Kelley Linehan, Marketing Director at the Bayfield Chamber of Commerce & Visitors Bureau, recommends hikers wear layered clothing as there are several up and down portions of the trail that will help heat up your circulation so you may find yourself "de-layering" to cool off! 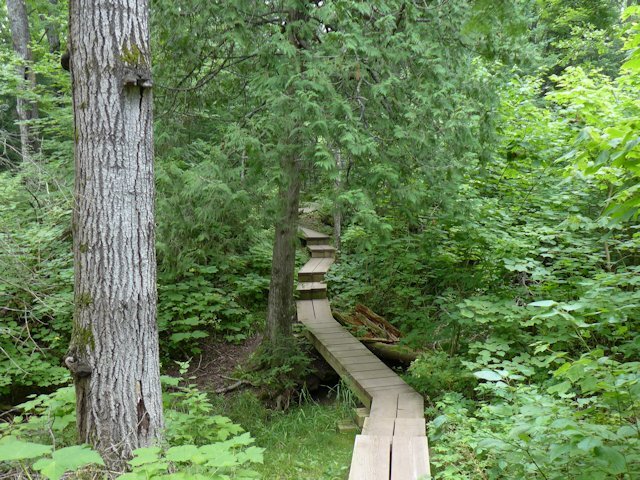 Generally the path is well trodden enough that you won't necessarily need snowshoes. But check conditions before you go in the event recent snowfalls have made snowshoes advisable. 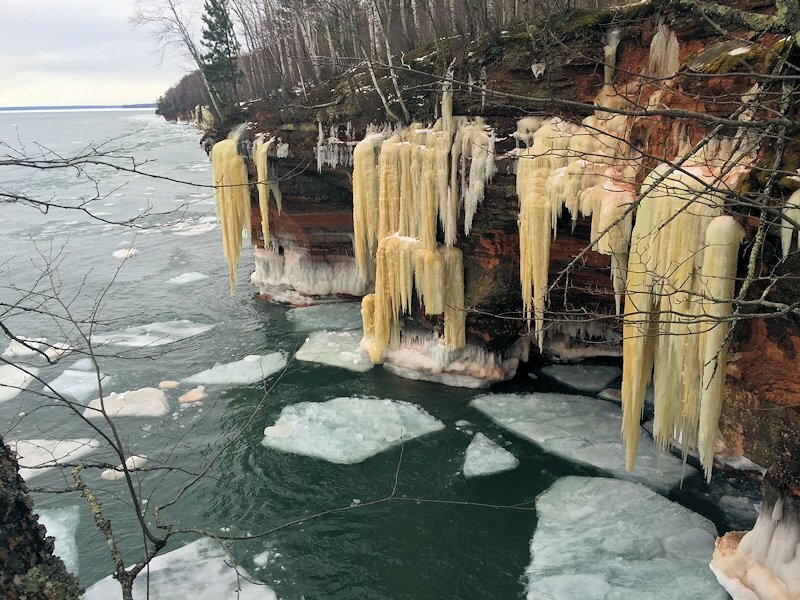 In any case you'll want somes sturdy boots (ice crampons might come in handy too) and pack some bars and water or beverages as the round trip could take up to 3 hours. 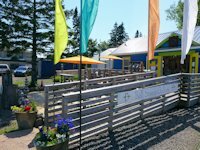 The Winter Trailhead runs from the Meyers Beach parking lot. There is a $3 park service parking fee. 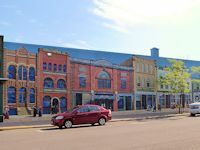 You can also rent a kayak or book a boat tour from Cornucopia, Wisconsin by Lost Creek Adventures or Good Earth Outfitters (see our links on the Cornie page). 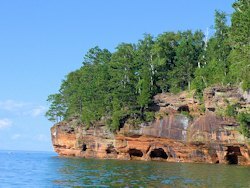 - Apostle Islands Travel Links - visiting the Apostle Islands National Lakeshore Park and historic Madeline Island.